Johannes Brahms (May 7, 1833 – April 3, 1897) was a German composer from what is known as the Romantic period, who predominantly lived in Vienna, Austria. Brahms was considered by many to be the "successor" to Beethoven, and his first symphony was described by Hans von Bülow as “Beethoven's tenth symphony,” a sobriquet that continues to be used today. Brahms was a vibrant and prolific composer who often utilized classical forms (symphony, concerto, sonata) in his compositions, eschewing the more popular genres of opera and symphonic poems. An avid outdoorsman, Brahms often turned to nature for ideas and inspiration, and much of his music "rose from mountains and forests and open sky," writes biographer Jan Swafford. "The melody for the finale of the C-minor Symphony actually traces the shape of the Alps, as Brahms viewed them during a hike." Brahms was born in Hamburg, Germany. His father, who gave him his first music lessons, was a double bassist and also owned an orchestra. At an early age, Brahms showed great promise on the piano and in composition, and he helped to supplement the family income by performing on the piano in restaurants and theaters, arranging musical compositions for his father's orchestra, and teaching. Although it is a widely told tale that Brahms had to play the piano in bars and brothels, recent research, done by Kurt Hoffman, suggests that this is probably not accurate. For a time, he also studied the cello, although his progress was cut short when his teacher absconded with Brahms's instrument. The young Brahms gave few public concerts and did not become well known as a pianist until later in his life. He gave the premiere of his Piano Concerto No. 1 in 1859 and the premiere of his Piano Concerto No. 2 in 1881. When he began to compose in earnest, his efforts did not receive much attention until he went on a concert tour with Eduard Reményi in 1853. On this tour he was introduced to Joseph Joachim, Franz Liszt, and later met with the great German composer Robert Schumann. Reményi was, however, offended by Brahms' failure to praise Liszt's Sonata in B Minor wholeheartedly on a visit to the Court of Weimar where Liszt was the court musician. Brahms, unfortunately, fell asleep during the performance of the piano sonata, a recently composed work. 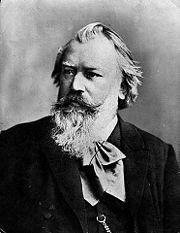 Many of Brahms' friends cited that Reményi, being the polished courtier, had expected the younger Brahms to conform to the common practice of politely applauding a celebrity's piece, which Brahms either failed to do or appeared to do with condescending compliment. Reményi told Brahms that their friendship must end although it remains unclear as to whether Liszt felt offended or otherwise. This breach between Brahms and Liszt may have begun because of Brahms' opposition to the stylistic principles prevalent in Liszt's music, which reflected the musical mode of the New German School. Joachim, however, was to become one of his closest friends, and Schumann, through articles championing the young Brahms, played an important role in alerting the public to the young man's compositions. Brahms also became acquainted with the composer and pianist Clara, Robert Schumann's wife, who was 14 years his senior. They carried on a lifelong, emotionally passionate, but always platonic relationship. Brahms never married. Brahms' grave in the Zentralfriedhof (Central Cemetery), Vienna. Brahms often felt that obtaining official positions would gain him more respectability. In 1859, he sought after and became a choral director in Hamburg. In 1862, he settled permanently in Vienna where he became the director of the Vienna Singakademie. It was at this time that Brahms began to concentrate fully on composing, and develop the clear "a cappella" style in his compositions. Subsequently, in 1872, Brahms conducted the Vienna Gesellschaftskonzerte, but stayed there for only another year. With works such as the German Requiem, Brahms eventually established a strong reputation and came to be regarded in his own lifetime as one of the great composers. This may have given him the confidence to finally complete his first symphony. This appeared in 1876, after about ten years of work. The other three symphonies then followed in fairly rapid succession (1877, 1883, and 1885). Brahms frequently traveled in northern and central Europe, both for business (concert tours) and pleasure. He often visited Italy in the spring, and Bad Ischl, Germany during the summer. He especially enjoyed spending time outside, where he felt that he could compose more creatively. In 1890, the 57-year-old Brahms resolved to give up composing. However, as it turned out, he was unable to abide by his decision, and in the years before his death he produced a number of acknowledged masterpieces, including the two clarinet sonatas Op. 120 (1894) and the Four Serious Songs (Vier ernste Gesänge) Op. 121 (1896). While completing the Op. 121 songs Brahms fell ill from cancer (sources differ on whether this was of the liver or pancreas). His condition gradually worsened and he died on April 3, 1897. Brahms is buried in the Zentralfriedhof in Vienna. Brahms wrote a number of major works for orchestra, including four symphonies, two piano concertos, a violin concerto, a double concerto for violin and cello, and the large choral work A German Requiem (Ein deutsches Requiem). The last is notable in not being a traditional, liturgical requiem (Missa pro defunctis), but a setting of texts which Brahms selected from the Luther Bible. Brahms was also a prolific composer in the theme and variation form, having notably composed the Variations and Fugue on a Theme by Handel, Paganini Variations, Variations on a Theme by Joseph Haydn, and Variations on the St. Antony Chorale. There were other sets of variations that contributed to the great renown and rising finances of the composer. Brahms also wrote a great deal of work for small ensembles. His many works of chamber music form part of the core of this repertoire, including the three string quartets, a clarinet quintet, two string sextets, the C minor piano quartet op. 60, a piano quintet, and the clarinet trio op. 114. His solo piano music is rapturous and is displayed in a dizzying output of ballades, rhapsodies, capriccios, and intermezzos. Yet above all, Brahms' piano variations demonstrate his command of developmental techniques in which the melodies intertwine and sometimes dramatically transform themselves into new themes. Brahms is also considered to be among the greatest of composers of lieder, of which he wrote about 200. Some of his popular songs are the "Zigeunerlieder," the "Liebeslieder Waltzes," "Vier ernste Gesange," "Mainacht," "Feldeinsamkeit," "Immer leiser wird mein Schlummer," and the "Magelone" cycle. He also wrote a set of chorale preludes for organ shortly before his death, which have become an important part of the standard organ repertoire. Brahms never wrote an opera, nor did he ever write in the characteristic nineteenth-century form of the tone poem. As a scholar, Brahms strongly believed in absolute music, that is, music that does not rely upon a concrete scene or narrative as the tone poem does, and thus used his profound understanding of the classical style to compose. Brahms venerated Beethoven, perhaps even more than the other Romantic composers did. Brahms' first symphony appeared to carry forth on a strong classical framework and critics dubbed Brahms as the next Beethoven. In the composer's home, a marble bust of Beethoven looked down on the spot where he composed. His works contain many stylistic examples that mirror the compositional techniques of Beethoven. Thus, the beginning of Brahms's first piano sonata is very close to the opening of Beethoven's Hammerklavier sonata; and the main theme of the finale of Brahms's first symphony is reminiscent of the main theme of the finale of Beethoven's Ninth. Brahms also loved the earlier classical composers Mozart and Haydn. He collected first editions and autographs of their works, and also edited performing editions. Brahms's affection for the classical period may also be reflected in his choice of genres: he favored the classical forms of the sonata, symphony, and concerto, and frequently composed movements in sonata form. Although Brahms is often labeled as the most "Classical" Romantic composer, this label does not reflect his works. It was his public divide between the musical schools of Richard Wagner and himself that gained him this label, as he often criticized Wagner's "lack of counterpoint" in his compositions. The rivalry between the "conservative" Brahms and the "radical" Wagner caused a divide in the musical community, yet was overstated even in their own time and has grown more implausible as their respective roles have been reversed in the twentieth century. If one closely examines the work of Brahms, they will notice that he is fully Romantic in style, blurring the lines of compositional form as much as any other composer was doing at the time. Although Wagner was a fierce rival of Brahms, later in his life Brahms admitted how much he respected Wagner's compositions. A quite different influence on Brahms was folk music. In his youth, Brahms used Hungarian folk music styles when arranging for his father's orchestra. Later, Brahms wrote settings for piano and voice for 144 German folk songs, and many of his lieder reflect folk themes or depict scenes of rural life. His Hungarian dances were among his most profitable compositions and in orchestrated versions remain well known today. Brahms was almost certainly influenced by the technological development of the piano, which reached essentially its modern form during his lifetime. Much of Brahms' piano music and many of his lieder make use of wide and richly spanned chordal clusters, expansive melodic lines, deep bass notes, and the pedal to obtain a rich and powerful sound. Like Beethoven, Brahms was fond of nature and often went walking in the woods around Vienna. He often brought penny candy with him to hand out to children. To adults, Brahms was often brusque and sarcastic, many times alienating people. His pupil Gustav Jenner wrote, "Brahms has acquired, not without reason, the reputation for being a grump, even though few could also be as lovable as he ." He also had predictable habits that were noted by the Viennese press such as his daily visit to his favorite “Red Hedgehog” tavern in Vienna and the press also particularly took into account his style of walking with his hands firmly behind his back complete with a caricature of him in this pose walking alongside a red hedgehog. Those who remained his friends were very loyal to him, however, and he reciprocated in return with equal loyalty and generosity. Hans von Bulow was a close friend and supporter, and enabled Brahms to hear many of his works with the use of an orchestra. He was a lifelong friend with Johann Strauss II though they were very different as composers. Brahms even struggled to get to the Theater an der Wien in Vienna for Strauss' premiere of the operetta Die Göttin der Vernunft in 1897, before his death. Perhaps the greatest tribute that Brahms could pay to Strauss was his remark that he would have given anything to have written The Blue Danube waltz. An anecdote dating around the time Brahms became acquainted with Strauss is that the former cheekily inscribed the words “alas, not by Brahms!” on the autograph score of the famous Blue Danube waltz. Starting in the 1860s, when his works sold widely, Brahms was financially quite successful. He preferred a modest life style, however, living in a simple three-room apartment with a housekeeper. He gave away much of his money to relatives, and also anonymously helped support a number of young musicians. Brahms was an extreme perfectionist. For instance, it is thought that the symphony is known as the first may not have been the first he composed, since Brahms often destroyed completed works that failed to meet his standard of quality. Another factor that contributed to Brahms's perfectionism was that Schumann had announced early on that Brahms was to become the next great composer like Beethoven, a prediction that Brahms was determined to live up to. This prediction hardly added to the composer's self-confidence, and may also have contributed to the delay in producing the first symphony. However, Clara Schumann noted before that Brahms' first symphony was a product that was not reflective of Brahms' real nature as she felt that the final exuberant movement was “too brilliant” as she was encouraged by the dark and tempestuous opening movement when Brahms first sent to her the initial draft. However, she recanted in accepting his sunny second symphony and was a lifelong supporter of that famous work in D major, one of Brahms' rare key usages. Johannes Brahms is ranked among the greatest composers of Western orchestral music. He would no doubt be gratified in knowing that posterity has indeed placed him among the three great "Bs" of German composers—Bach, Beethoven, and Brahms. He was produced works that have become staples of the repertory. His four symphonies, two piano concertos, violin concerto, and chamber music are both technically demanding and among the most sophisticated and exquisite compositions of the Romantic era. In contrast to the stormy, passionate works of "neo-German" composers such as Richard Wagner and Franz List, Brahms retained reverence for the classical heritage and maintained the Romantic tradition of his great predecessor, Beethoven. Although controversy developed between supporters of Brahms and the followers of Wagner in particular, Brahms was not a reactionary. He looked both backward and forward, producing innovative harmonies that prompted Arnold Schoenberg to write "Brahms the Progressive," a 1933 essay that has influenced contemporary evaluations of the composer. Though Brahms’ German Requiem is considered by many to be his greatest work, for much of his life Brahms’ faith remained an enigma, even to those who knew him personally. A devout student of the Bible, Brahms had little patience for the doctrines and rituals of the church, and spoke provocatively of his humanistic credo. Yet late in his life, in a series of interviews with American journalist Arthur M. Abell, Brahms attributed much of his creative inspiration to consciously seeking a spiritual connection to God. Connecting to God, he said "cannot be done merely by will power working through the conscious mind, which is an evolutionary product of the physical realm and perishes with the body. It can only be accomplished by the soul-powers within---the real ego that survives bodily death. Those powers are quiescent to the conscious mind unless illuminated by Spirit." Brahms was likewise generous, living simply, giving his time to others, and sharing his growing wealth liberally. As one of the central composers of the classical music tradition, Brahms and his music have appeared widely in films and other works of popular culture. ↑ Kurt Hoffman, Johannes Brahms und Hamburg (Reinbek, 1986) (in German: includes detailed refutation of the traditional story of Brahms playing piano in brothels, using the writings of those who knew the young Brahms, as well as evidence of the Hamburg's close regulation of those places, preventing the employment of children). Brahms, Johannes. Johannes Brahms: Life and Letters, edited by Styra Avins, translated by Josef Eisinger. 1998. A biography by way of comprehensive footnotes to a comprehensive collection of Brahms's letters (some translated into English for the first time). Geiringer, Karl. Brahms, His Life and Work. New York: De Capo Press, 1984. ISBN 0306802236. A bio and discussion of his musical output, supplemented by and cross-referenced with the body of correspondence sent to Brahms. Rosen, Charles. Critical Entertainments: Music Old and New. Cambridge, MA: Harvard University Press, 2000. ISBN 0674177304. Swafford, Jan. Johannes Brahms: A Biography. New York: Vintage, 1997. ISBN 0679745823 A comprehensive (752 pages) look at the life and works of Brahms. All links retrieved May 11, 2018. Brahms Biography and free Brahms audio mp3 files. Der Tod und Johannes Brahms, by Wilhelm Otto Deutsch. Death as a major theme in Brahms' work (1997). This page was last modified on 11 May 2018, at 16:40.